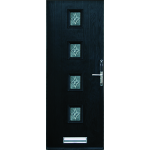 Peterborough Doors offer an excellent selection of high quality GRP UPVC Composite doors. Our Heritage style UPVC GRP Composite doors come with a multi point locking system, toughened Pilkington energy saving safety glass, reinforced frames and panels, left or right hand hinged, open in or out and not forgetting a full 10 year guarantee. Excellent value GRP UPVC Composite doors. Our GRP UPVC Composite doors are available in white, light oak or rosewood and come with an excellent choice of furniture to compliment your already great looking UPVC GRP Composite door. Peterborough Doors is a family business and we guarantee to supply your family with excellent quality UPVC GRP Composite doors and uPVC composite doors. 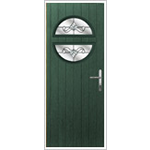 Circle uPVC GRP composite door featuring chrome hardware and a crystal bohemia glass design. Ideally suited as a garden gate this model is available with a choice of 34 glass designs and ticks all the boxes of a GRP uPVC composite door. This Circle GRP UPVC Composite Door will not lose its colour at all. 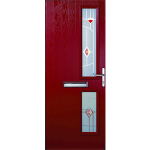 A half glazed uPVC GRP Composite door with chrome hardware featuring a zinc art abstract glass design, this model has a minimum life expectancy of 30 years and is extremely eco-friendly, insulating energy which as current government statistics show can have a huge impact on bringing down the price of your heating bill. 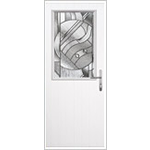 A four windowed single design uPVC GRP Composite door that allows you to customize the design of the glass. This model comes with chrome fittings and hardware as standard and a tafetta glass design but allows for customisation. As with all Peterborough Doors included with a SBD lock which come fitted with the newest Yale technology and are recognised by Insurance companies and the police as being the most secure locks on the market. Your 10 year warranty also includes the locks and their mechanisms. A design classic, the twin side uPVC GRP Composite door is a stable and secure door with two windows on the handle side, these can be customised to suit your requirements and are made with the latest toughened glass technology. Coming with chrome fittings, locks and everything you need to hang this door as standard. Peterborough Doors is a family business and we guarantee to supply your family with excellent quality GRP UPVC Composite doors within the Peterborough area. uPVC GRP composite doors Peterborough.